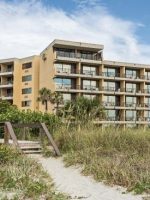 For a wide variety of accommodation options in a central Cocoa Beach location, this beachside property is a good choice for families. 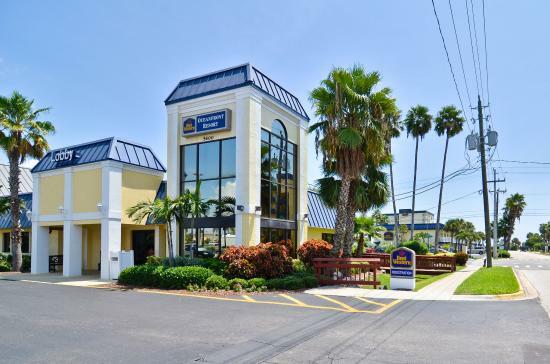 The first thing to know about the BEST WESTERN Ocean Beach Hotel & Suites is that it’s a sprawled out compound, with 230 rooms and 62 suites between five different buildings; they cover the good part of two city blocks. This can be a real advantage for large family gatherings that require many different room types and price ranges, but be aware, too, that it can be a disadvantage if you’re looking to have everyone concentrated in a central area. The different buildings are accessed via quiet side streets, but it still requires walking between them. 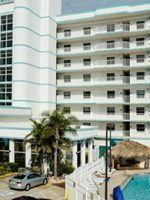 The eight-story tower, the property’s most recognizable feature, fronts the ocean and has the nicest rooms with the best views that take in the pier and golden stretch of sand. Set back from here are low-rise buildings with two or five stories, some with drive-up parking and pet-friendly accommodations. They feel more like a motel than a resort. Having access to a full-size refrigerator and microwave, an option in many of the rooms with kitchenettes, can be a real money-saver for families who plan to spend more than a few days here and don’t want to bleed money at the many nearby restaurants. There’s nothing modern about the hotel’s dÃ©cor, but the beds are comfortable enough and whether you’re in the tower or one of the smaller buildings, you’re never more than a few minutes’ stroll to the beach. The standard and precise type of room you require is going to determine where you're located on this large property. The hotel has 230 rooms and 62 suites that are spread between five different buildings across two city blocks. They extend from the oceanfront to A1A (the main road heading south along the beach). Wi-Fi is free throughout all rooms. Bathrooms vary between rooms and the most obvious variable is that you'll either have a shower-in-tub combo or one of those square showers with a shower curtain that may or may not keep the floor in the bathroom from getting wet when the shower is on. 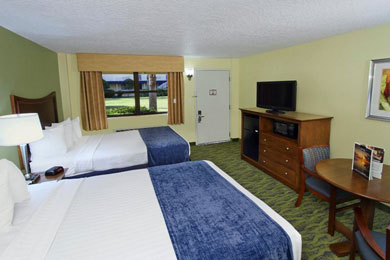 Rollaway beds can be added to all rooms for $10 per night. Cribs are available at no extra charge, but you should request them when booking to ensure they'll be available during your stay. Rooms in the eight-story tower fronting the ocean are the nicest, with large private balconies extending from oceanfront or ocean view rooms and the option of a room with a single king bed or two queen beds. All of these rooms come with a mini-fridge and a microwave for storing food and preparing simple meals, and coffeemakers are also standard. Connecting rooms are an option here, with rooms with one king bed connecting to rooms with two queen beds. 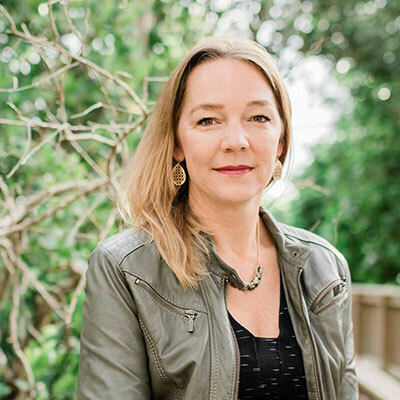 Set back from the ocean and without ocean views, the five-floor building, which is also where the hotel's free daily breakfast is served, has two-room suites with extra large balconies from which you can gaze out over the pool. These two-room suites have a private bedroom with a king bed or two queen beds and a separate living room with a double sofa bed and an additional TV that gives the space a feeling of being an additional bedroom. You can sleep up to six or seven comfortably. These suites have well-outfitted kitchenettes with full-size refrigerators and freezers, a microwave, counter-top bar area with seating and a sink (there are no stoves or ovens, however). Families often prefer to stay here because of the privacy of having the bedroom separate from the living room and kitchenette area. Rooms with two queen beds can be connected to rooms with one king bed. The garden courtyard buildings, which look like your standard issue motel on the outside and inside, are the least expensive option for staying at the BEST WESTERN and have the added bonus of permitting furry friends (for $15 per night, plus a $50 cleaning deposit). Some of the rooms in these two-story buildings are drive-up, making it convenient to leave things in your car to access when you need them. You can choose from rooms with two double beds, two queen beds or a single king bed. There's an option in these buildings, too, to request a room with a mini-kitchenette. Your options for connecting rooms include rooms with two double beds (each) that connect, or rooms with a single king bed each that connect to each other. Great location, very clean and quiet. There’s a Starbucks and a nice bar just off the lobby. There’s also a really big store attached to the lobby. There’s also a grocery store across the street. The room is clean and quiet. Small refrigerator and microwave in room also. Pool area is very small. Only 5 lounge chairs and one table in the area. You can rent “beach” chairs for $8 for the day if you desire. Otherwise it’s a towel on cement. We love this hotel. This was our second trip here. 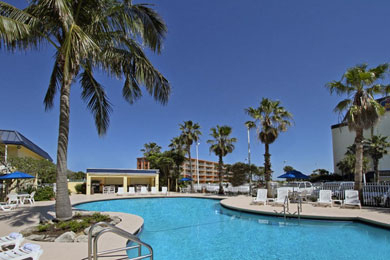 Great value for the money...steps from the beach and the Cocoa Beach Pier. Heated pools, fire pits, friendly staff, full continental breakfast included. We will be back! 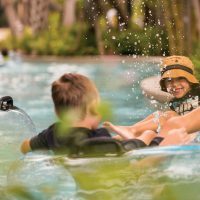 Spending as much time splashing in the warm surf and building castles in the sand is the main prerogative for most of the families who choose to vacation at this hotel. 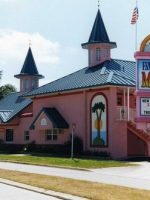 And its oceanfront location -- right next to the Cocoa Beach Pier, with its fishing, dining and shopping attractions all close by -- are a big lure. The beach in this part of Cocoa is normally quite busy compared to other nearby stretches, but access to beach rentals (umbrellas and lounge chairs) and being within easy reach of restaurants have their own appeal and ease. You can rent a beach umbrella and two chairs from a private vendor on the beach in front of the hotel for $20 per day, but if you're staying longer than a day or two, it's well worth investing in your own beach equipment. The hotel's two small outdoor swimming pools are nothing special, positioned in between buildings and with parking lot views, for the most part, but they do the trick on a hot day. Open from 8 a.m. to 10 p.m. daily, they're heated during the winter months, too, making them pleasant for year-round swimming. Kids have plenty of fun splashing in them when they tire of the beach. There are no lifeguards on duty and during peak times, the pools get very busy and you may have trouble getting a lounge chair. 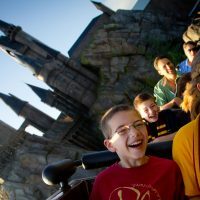 Other family activities abound in Cocoa Beach and include everything from boating and fishing excursions to visiting nearby Kennedy Space Center and watching rocket launches from the beach. 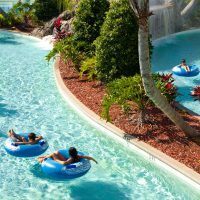 In short, as long as you like the water and Florida sun, you won't get bored with the beach-centric activities here. The fact that breakfast is included for all guests is a real plus for many families, as it makes it easy to start your day with a hearty meal and get straight to the beach. The breakfast room is in the building with the family suites, so it's a bit of a walk from other buildings on the property and you'll want a stroller if you have small children who aren't yet walking. Breakfast is served from 6 to 10 a.m. daily and is a standard buffet of cold cereals, yogurts, juices and fruit, as well as a few hot items along the lines of eggs, biscuits and bacon or sausage. Kids have a blast pouring the batter and prepping their own pancakes at the DIY griddle, too. 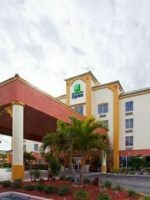 Breakfast is the only meal served at the hotel, but there are several restaurants within walking distance, as well as a Publix supermarket right across the street. A steakhouse that's unaffiliated with the hotel is located right off the lobby. Self-parking is free in an outdoor, lit parking lot. Self-serve laundry machines ($1.25 per load; get quarters from the front desk) are available in all buildings and detergent packets are also available. There are a few computers in the lobby where you can get on the Internet and print things for free. The hotel's gym is open from 8 a.m. to 9 p.m. and has treadmills, stationary bikes and weight machines. 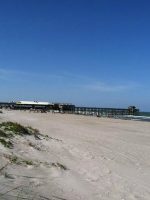 Cocoa Beach is a popular destination year-round, and crowds particularly swell during spring break in February and March, around Easter, and over Memorial Day, Fourth of July and Labor Day. You'll get some of the best deals here and have the beaches largely to yourself during the shoulder season months of late-September and October into early November and again in January and April and May. The area sees many snowbirds migrating down from the northeast and Canada from after the Christmas holidays into early May. And weekends are often busy on the beach, too, with locals coming out to play and Floridians from inland areas like Orlando making the day trip for fun in the sun. 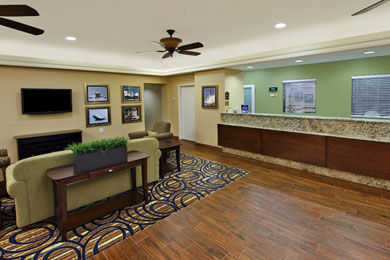 Most guests at this BEST WESTERN fly into Orlando International Airport, located roughly an hour west of the hotel and accessed by a relatively straight shot of mostly highway (toll road) driving. Orlando's airport has flights by all major national carriers, as well as many international airlines. Alternatively, you can consider flying into the much smaller but closer Melbourne International Airport (about 25 minutes away), with flights offered by Delta and US Airways from major cities in the South. 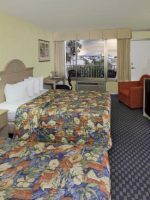 Unless you plan to spend all your time at the hotel, you'll want to consider renting a car during your stay for easy access to nearby restaurants and attractions, such as the Kennedy Space Center Visitors Center. Car rental companies are available in Cocoa Beach. Kids love to ride the Cocoa Beach Trolley, which runs up and down the beach (including to Port Canaveral) and has a stop near the hotel. The trolley operates Monday to Saturday from 7 a.m. to 9 p.m. and Sunday from 8 a.m. to 5 p.m. Kids under 5 years ride for free and it's $1.25 for adults, with discounts for seniors. If the kids are old enough to watch themselves in the evenings (the hotel does not offer babysitting), steal away for a sunset cocktail and take in some live music at Coconuts on the Beach, about 2.5 miles away. The trolley can be your designated driver. The people watching is great, barstools perch right over the beach and there's a simple menu with things like burgers, crab cake sandwiches and fish reubens. Alternatively, head to Pineda Crossing for fresh seafood and fine dining.